Micro-perforated table tent name holder sheets for use with laser, ink-jet or dot matrix printers and copiers. Smooth edges, no cutting required. For DURABLE items 8047, 8051. Micro-perforated badge insert sheets for use with laser, ink-jet or dot matrix printers and copiers. Smooth edges, no cutting required. For DURABLE name badges 8110, 8120, 8123 and 8124. Micro-perforated table tent name holder sheets for use with laser, ink-jet or dot matrix printers and copiers. Smooth edges, no cutting required. For DURABLE items 8048, 8052. 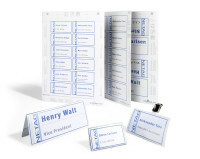 Micro-perforated table place name holder sheets for use with laser, ink-jet or dot matrix printers and copiers. Smooth edges, no cutting required. For DURABLE item 8205. 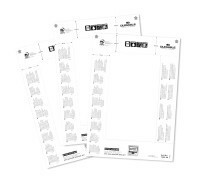 Micro-perforated badge insert sheets for use with laser, ink-jet or dot matrix printers and copiers. Smooth edges, no cutting required. 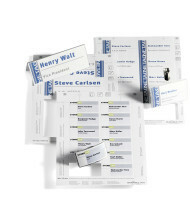 For DURABLE name badges 8003, 8106, 8135, 8138, 8139. Micro-perforated badge insert sheets for use with laser, ink-jet or dot matrix printers and copiers. Smooth edges, no cutting required. For DURABLE name badges 8111, 8214, 8215, 8216, and 8217.